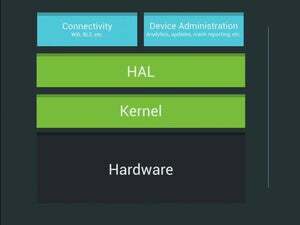 Android is headed to the internet of things in the form of Android Things, an operating system that grew out of Project Brillo and will be able to get updates directly from Google. With the home IoT industry still emerging from the hobbyist realm to mass market, Android’s traction in the smartphone realm could make it a popular platform for devices like lights, locks, thermostats, and household appliances that consumers want to manage through their phones. On Tuesday, Google announced a developer preview of Android Things, which will be able to run on the Raspberry Pi 3, Intel Edison, and NXP Pico hardware platforms. It will be easy for developers to scale their prototypes up to large production runs using custom versions of those boards, Google says. Google announced Project Brillo at the Google I/O conference in May 2015 along with Weave, a platform for IoT device and cloud communication. The idea behind Brillo was to create a stripped-down version of Android for devices that are smaller and less powerful than smartphones. Android Things incorporates the feedback that Brillo generated, the company says. It’s designed to let developers quickly build devices that can use Android APIs and Google services. Android Things will include tools such as the Android SDK (software development kit), the Google Cloud Platform, Google Play Services, and Android Studio. Google will be able to update Android Things devices directly, a key feature both for security and for adding features over time. The updating capability will be available for the developer preview in the coming months, Google says. That feature will also allow developers to send out their own updates to their devices. Also on Tuesday, Google said it’s updating its Weave IoT communications platform with a version that will make it easier for IoT gear to connect to the cloud and use Google services. The Philips Hue and Samsung SmartThings product lines already use Weave, and other vendors—including Honeywell, LiFX, and Belkin WeMo—are implementing it, Google says. Weave includes an SDK with schemas for light bulbs, smart switches, smart plugs, and thermostats. Google says more schemas are on the way. The company is also working to merge Weave with Nest Weave, a protocol for communication among products from Google parent Alphabet’s Nest division and between those devices and ones from other vendors.